If you have never tried making homemade granola, instantly add this to your to-do list! You will be shocked by just how easy it is to make and how much better it tastes than store-bought granola. I went on a mission to carefully create a granola so addictively good, you wouldn’t believe it could actually be healthy. 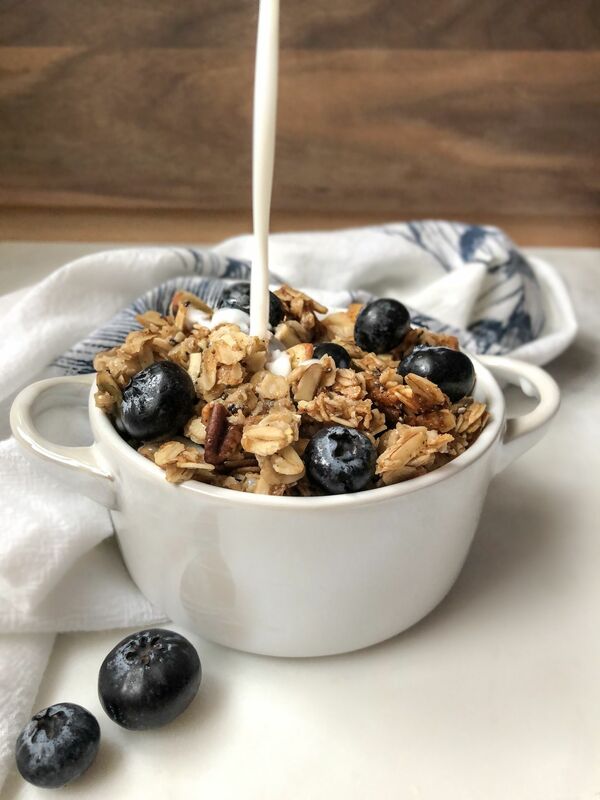 One weekend filled with dozens of batches, countless rounds of taste-testing (my husband’s favorite part), and many tweaks later, this healthy, honey coconut granola was born! The best part about this granola is how much wholesome goodness is packed into every scrumptious bite. From the antioxidant-rich honey and pumpkin seeds, to the heart-healthy oats, high-protein almonds, anti-inflammatory cinnamon, and decadent coconut full of heart-healthy fats, this is a recipe you can feel really good about. Enjoy a handful on it’s own, toss it into oatmeal for a crunchy twist, or sprinkle some on top of Greek yogurt for a power breakfast. The options are endless! In a large bowl, combine all dry ingredients (oats, nuts, pumpkin seeds, shredded coconut, coconut sugar, cinnamon, salt, and chia seeds). In a small microwavable bowl, melt the coconut oil. While the coconut oil is still warm, mix-in the honey. Pour the coconut oil / honey mixture over your dry ingredients. Thoroughly mix the wet and dry ingredients,. I use my hands for this step to ensure all dry ingredients get evenly coated with the delicious coconut oil / honey mixture. Cover two baking sheets with parchment paper or a silicon baking sheet. Pour 1/2 the granola into the center of each baking sheet, and spread evenly using a spatula or your hands so everything cooks evenly. Bake for 10 minutes, then remove from the oven for a quick mix! Using a spatula, mix the granola on the baking sheet and then re-spread into an even layer. Place granola back into the oven and bake for another 13 minutes. Remove granola from oven and allow it to cool for 30-45 minutes. Using your hands, break-up the granola into small pieces, and enjoy!